A luxurious mix of flakes with loads of delicious fruits and nuts, gluten free! 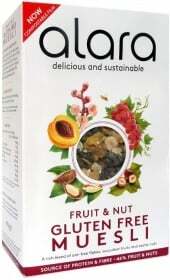 Alara Fruit & Nut Muesli Gluten Free is the product that is really able to add a luxurious twist to your life, for the bright splash of dried fruit, crispy nuts and varied cereals makes it be worth a king. Containing no wheat, this muesli is of course gluten free and features alternative flakes made of rice, soy and millet. Plus, being dairy free it suits those intolerant to lactose. In combination with raisins, apricots, hazelnuts, sultans and brazil nuts the product is a rich source of proteins, fiber and complex carbohydrates for ultimate energy load and efficient digestion and to keep you satiated for a longer time. Learn what makes a gorgeous breakfast with Alara Fruit & Nut Muesli Gluten Free and enjoy the inherent goodness of its natural ingredients. Have a question about Fruit & Nut Gluten Free Muesli? What is it, what does it do, how and when to use or something else? Ask us.